F Simple and Serene Living: just where are my old kitchen graters? just where are my old kitchen graters? 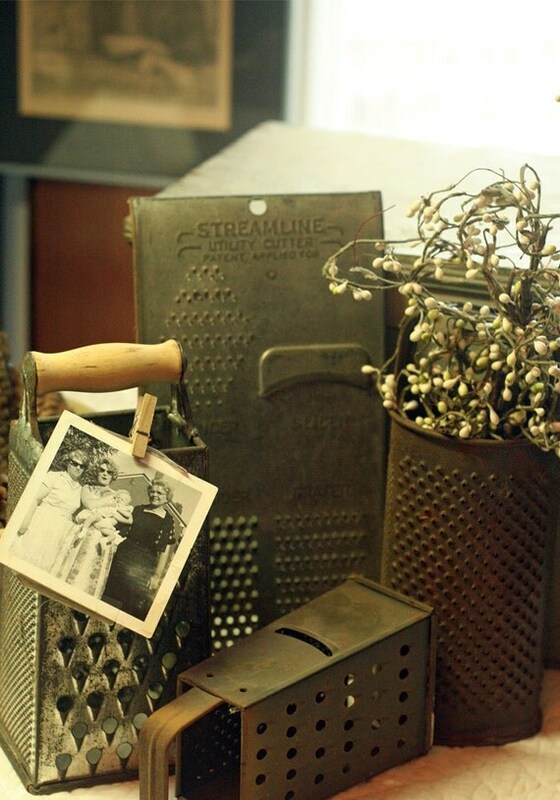 I am always looking for new and unusual ways to utilize old vintage kitchen ware. I love old kitchen graters. I had a very nice collection that seemed to disappear one of the last times I moved and now I am thinking it is time to start looking for some to replace the ones I lost. I use to hang them as a collection on a wall and place some in an old dough bowl, but now I think I would like to find some new ways to use and display them. Here are some ideas I found that I thought I would share. I like this idea of pinning an old photo on them and displaying some berries. 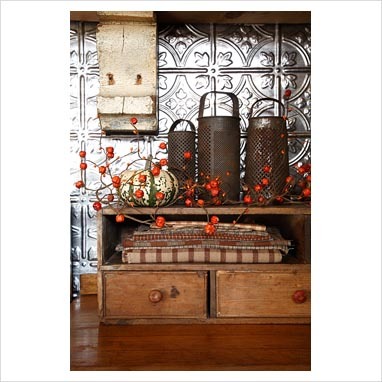 I love the look of these in front of the tin wall, combined with an old wood shelf and some linens. Very farmhouse. I would never have thought of using them as vases. Possible a small jar inside to hold water. This is adorable. I wish I was this creative. hmmmm!!! 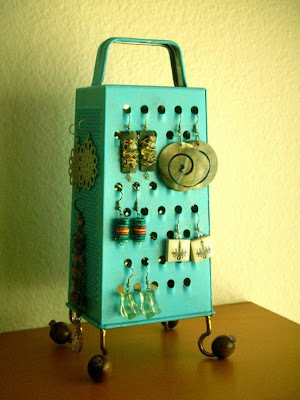 a grater in your bedroom to display your earrings. A cute idea for your craft room. and of course, with all of their little holes, they are perfect to repurpose into lights. Do any of you collect graters? I would love to hear your ideas on how to use them. 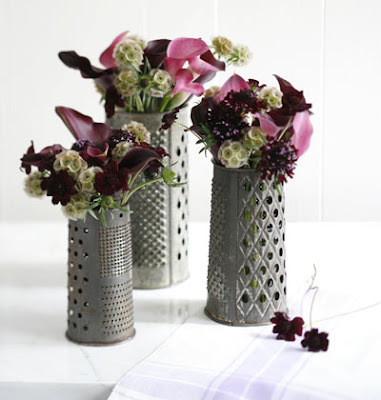 I love the vase idea with the graters, I would have never thought of that! Love the different uses for graters! Such clever ideas! I am one o your new followers. Hope you will visit and follow me! 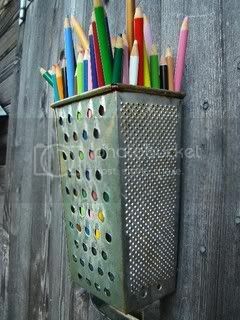 I love all of these ideas for a grater collection. I don't have a collection (just one) but if I did, perhaps, they could also be used as luminaries in the garden. Following you back. Thanks for dropping by my blog. Such creative ideas. All my gadgets are in drawers! A lady in our church collects vintage graters, and has some really unique ones. At Christmas, she runs artificial vines and berries around the display and puts lights under a few here and there! Makes a beautiful display! I love the first set you have featured, with the old photo clipped to the front of one. All of vignettes you have featured are unique and pretty! I saw them displayed in an antiques shop over lit votives. Your post show graters in a most subdued and lovely way. But I will always remember how I hated that job when I was kid and mom would tell me to grate cabbage or cheese. That is a lot of inspiration for old graters. I have one that I have had for years that I use all the time...I will be looking for more at the thrift stores. I love the way they are used as lighting fixtures. I am your newest follower! I always love seeing the creative ideas here. I need that grater to hold my earrings for sure. I've never seen such cute graters! I have two in my stash waiting to be used. The light fixture takes the cake however. I really like the earring holder. Very cool ideas. I just found your blog and enjoyed this post. I love the old graters displayed in front of the tin tiles. And the one used for a pencil holder! How creative! I am in LOVE with this posting! I especially like the idea of using a grater to hold earrings, etc.! I found your blog on Cozy Little House and am so glad I did! I'm looking forward to following you! OMG Grater VASES! In love!! How cool! Who knew there were so many uses for graters?! Love these ideas! The vases idea and the pencil holder are adorable. Why haven't I thought of that?